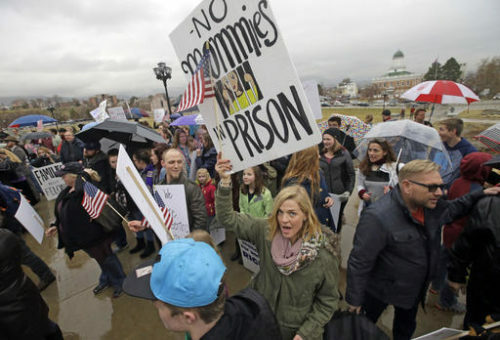 SALT LAKE CITY (AP) — The family on the TV reality show “Sister Wives” and several hundred other protesters in polygamous relationships and their supporters said Friday they won’t stop fighting for the legal right to plural marriage. Holding signs that read, “I love all my moms,” and “If we were gay, we’d be OK,” the group rallied in the rain on the steps of the Utah Capitol on Friday afternoon. The demonstration comes a month after the U.S. Supreme Court declined to hear a case from Kody Brown and his four wives on the TLC show “Sister Wives” challenging Utah’s bigamy law. The high court left Utah’s law in place, but state legislators are considering changes this year that would leave those convicted under it facing harsher penalties if they’re also convicted of other crimes such as domestic abuse. The sponsor, Republican Rep. Mike Noel of Kanab, said other changes in his proposal would help the law withstand any future court challenge. Shortly before the rally began outside the Capitol, Noel and more than half a dozen women who left polygamous communities held a news conference to defend his bill, saying the plural relationships hurt women and children. They said the closed communities where polygamy is practiced can be rife with welfare fraud and child abuse, sexual abuse and forced labor. Outside the Capitol, polygamy supporters said the law criminalizing a relationship between consenting adults keeps anyone witnessing crimes like fraud or abuse from speaking out. Prosecutors say they generally leave polygamists alone but need to keep the ban to pursue polygamists for other crimes. Only 10 people have been charged with violating the law between 2001 and 2011. Utah’s current polygamy law bars married people from living with an extra spouse or claiming to have a second purported “spiritual spouse.” Noel’s bill would make it a crime only if someone lives with and claims they have another spouse. It would also shield from prosecution anyone who leaves a polygamous relationship because they feared coercion, bodily harm, are underage or trying to protect a minor in a plural family. The bill was approved by a House committee this week and awaits a vote by the full House of Representatives. Court documents show there are about 30,000 polygamists in Utah. They believe polygamy brings exaltation in heaven — a legacy of the early Mormon church. The mainstream Church of Jesus Christ of Latter-day Saints abandoned the practice in 1890 and now strictly forbids it. Noel, who is Mormon, said Friday that his great-grandfather was jailed for being a polygamist and he’s irritated that today’s polygamists refer to themselves as Mormons. “They’ve hijacked my religion and I actually resent that,” Noel said. Brenda Nicholson, a former member of a sect led by Warren Jeffs on the Utah-Arizona border, said polygamy is not just a relationship involving consenting adults. Jeffs now is serving a life sentence in Texas after being convicted of sexually assaulting girls he considered wives.